Autumn FernHerbaceous fern. Dwarf habit with young papery fronds that display coppery-red color, mat.. Autumn FernSemi-evergreen fern. Compact growth. Coppery-red new foliage, more intense than the strai..
Parsley Male FernEvergreen/semi-evergreen. Shapely form and gracefully arching fronds. Parsley-like .. 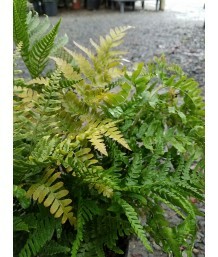 Robust Male FernSemi-evergreen fern. Fast growth. 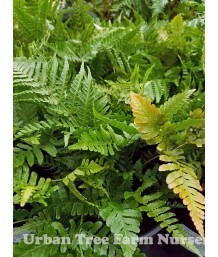 Thick, upright green fronds have distinctive undul.. Fancy Male FernEvergreen fern. North American native. Wide clumping form. Circular clusters of lacy ..
Mexican Male FernEvergreen fern. Native to high mountains of Mexico. Upright clumping habit. 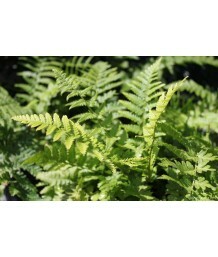 Triangu..
Buckler FernSemi-evergreen fern in mild climates. Deciduous where there is frost. Green bipinnate up..